Notice in the picture above, the XL that follows the Service Description. This is an important part of your tire size. If your car came equipped with XL tires, there’s most likely an important reason. 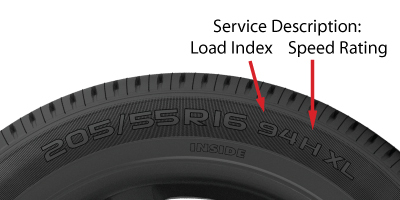 The XL stands for eXtra Load and means the sidewalls of the tire are stronger and capable of handling heavy load requirements. In many cases it is obvious why you would need XL tires, especially for limousines, trucks and utility vehicles. But even cars like the Prius can require XL tires due to the weight of the battery. In all cases where an XL tire is specified for use, this should not be ignored. If a non XL tire is used when an XL tire should be used, the risk of a blowout increases significantly as the sidewall cannot withstand the capacity of the load, especially under fast driving conditions. P-metric tires or LT tires: Which Is Right for My Truck? What are the Best Horse Trailer Tires?